The natural scenery of high mountains, rugged coastline and quaint crafting hamlets is timeless and stunning; the Highlanders are warmly hospitable; and there is abundant open space and uncongested roads. Ullapool is centrally located and an ideal base for exploring the Highlands and Islands. 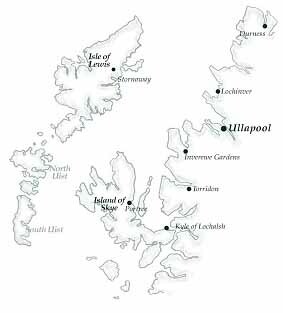 Ferries sail to the Western Isles and there are cruises to the Summer Isles. For those whose pleasure is observing the natural world, there is ample opportunity for birdwatching, exploring the shore- and sea-life and photographing flora and fauna. Superb fishing, golf, sailing, climbing and walking are all within a few minutes drive from Ullapool. And even in wet weather, Ullapools modern Leisure Centre offers swimming, fitness and games facilities. Many Highland landmarks and historic sites are but a short distance from Ullapool; the falls of Measach in the Corrieshallach Gorge, the world famous Inverewe Gardens, the Polly Nature Reserve, the sands at Gruinard Bay and Achnahaird, the Lael Forest Garden and Trail, the 1870s arboretum and walled garden at Leckmelm, and , at Achiltibuie, the smokehouse for game and poultry and the hydroponicum with exotic fruits and vegetables.